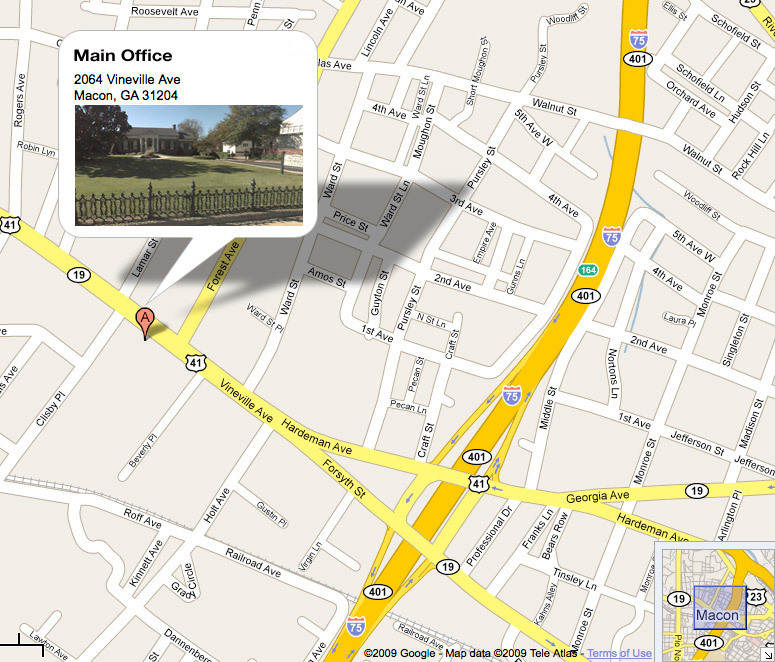 Our office hours are 9:00am to 5:00pm Monday through Friday. We do not close for lunch. The phones are answered from 9:00 am to 5:00pm daily. Our receptionists will answer your phone calls and take your message or questions. These messages are forwarded to a staff member who can return your call with advice. Our staff gets numerous calls each day and tries their best to return calls the same day. This is not always possible. The most urgent calls are made first and all others are prioritized as to urgency as best as we can. If your call has not been returned after 24 hours, please call back. If there seems to be a problem, please ask to speak with the manager. We have an answering service that answers our phone calls after business hours. If you dial our primary numbers: (478) 743-1478 or (478) 745-5035, you will be instructed to call our answering service and will be given their number. One of our doctors is available 24 hours a day, seven days a week. If you have general questions or non-emergencies, please call during regular hours. Do not hesitate to call at any time, day or night if you have an emergency. If you have an emergency and feel there is time, call our office. We will give you advice and help. We have an answering service that answers our phone calls after business hours. If you dial our primary numbers: (478) 743-1478 or (478) 745-5035, you will be instructed to call our answering service and will be given their number. One of our doctors is available 24 hours a day, seven days a week. Do not hesitate to call at any time, day or night if you have an emergency. If there isn't time, PLEASE CALL 911 or go straight to the urgent care/emergency room. The doctor there will evaluate you and call the cardiologist who takes care of you. Please call your pharmacy and give them the name of the needed refill. If you are out of refills, the pharmacist will call us for authorization to refill. It is best to get your refills 3-4 days before your medicine runs out. We do try to return these pharmacy calls within a 48-hour period. From 1-75 - Turn right onto Hardeman Ave. (Hardeman merges with Vineville) Proceed .3 miles (2 lights). Heart of Georgia Cardiology is on your left (Just after 2nd light - Forest Ave). From Pio Nono/247 - Take a right onto Vineville Ave. Proceed miles .7 miles (3 traffic lights). Just after Clisby Place (3rd light) you will see Heart of Georgia Cardiology on you right. From 1-16 - Take I-75 S. Hardeman Ave. is the first exit after the merge. Turn right onto Hardeman Ave. (Hardeman merges with Vineville) Proceed .3 miles (2 lights). Heart of Georgia Cardiology is on you left (Just after 2nd light - Forest Ave). Our new building offers a sheltered drop-off and a spacious parking lot in the back. An elevator to the second floor is located in the climate-controlled vestibule (beside the drop-off). Concerned about trying to pull back onto Vineville Ave.? You will exit to the rear, through the parking lot; this lets you out onto Clisby Place Turn right and you've got a traffic light to let you easily go left or right onto Vineville. © Heart of Georgia Cardiology | All rights reserved.